Mali coach Patrice Carteron has praised the performance of his players after their 3-1 win over Ghana in the 2013 African Cup of Nations third-place playoff. Striker Mahamadou Samassa opened the scoring with a header in the 21st minute, captain Seydou Keita added to the lead with a close-range shot in the 48th, and Sigamary Diarra sealed the victory in stoppage time, ending Mali's emotional campaign. "We have a fantastic leader in Seydou Keita," Carteron told reporters after the game. "He is so professional that if he wants, he can play until he is 40 years old," the coach added. "He works really hard, he is unbelievable. He likes football and physically he is fantastic." The 42-year-old coach said he was delighted to walk away with a third-place medal despite not going all the way in the tournament for the second time in a row. "Most of the people before the competition thought that we could win this competition," the coach said. 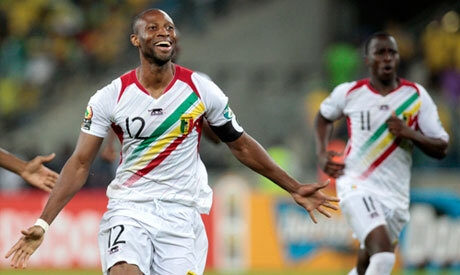 "We must realise that Mali do not have as much money as a lot of big footballing nations in Africa. "I'm sure the people of Mali will be so proud of what the team did during the competition." The Eagles are bidding for a place in the 2014 World Cup in Brazil and will face Rwanda in the qualifiers next March.